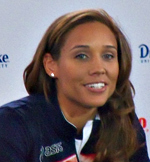 Des Moines native Lolo Jones will accomplish a rare feat next month. Jones has been selected to be a member of the U.S. Olympic bobsled team, making her one of just ten American athletes to compete in both the summer and winter Olympics. UNI track coach Dan Steele knows all about making the transition from the track to the bobsled. Steele was a three time qualifier for the Olympic Trials in the decathlon. After failing to make the Olympic team, he switched to the bobsled and qualified for both the 1998 and 2002 U.S. teams, winning a bronze medal in 2002. Steele says he’s impressed that Jones has also been able to make the transition between the two sports. “I think she’s doing what she needs to do,” Steele says. His brother is the CEO of U.S.A. Bobsled and some of his teammates are Jones’ coaches. “She definitely earned her way onto that team, she’s a hard worker and I think she’s surrounded by some really good people. She’s a great athlete, as long as she continues to do the things she’s doing right now, I think she should have a successful Olympics,” Steel says. Jones will be joined by Olympic track teammate Lauryn Williams on the U.S. bobsled team. Steele says it’s a fairly natural progression for sprinters to move to the bobsled as he says the technique is very similar to what track athletes do throughout their career. He says that allows track athletes to learn the bobsled even very quickly. The Winter Olympics begin on February 7 in Sochi, Russia. The women’s bobsled competition will be held on February 18 and 19.